American sportswriter Grantland Rice famously said, “It's not whether you win or lose, it's how you play the game,” but winning is all that matters in contemporary sports, and athletes under tremendous pressure to find any competitive edge frequently turn to performance-enhancing drugs. McPherson notes that ingesting substances for a competitive edge is an old practice. Ancient Greek athletes consumed bull and sheep testicles for their large amounts of testosterone. Roman gladiators used stimulants to maintain stamina and increase strength. The use of PEDs became more common and widespread with the introduction of anabolic steroids. 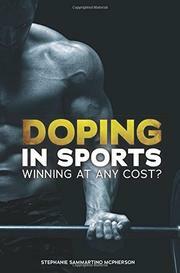 In the latter half of the 20th century, the intense pressure to win and high financial stakes increasingly drove athletes to doping of various kinds to improve performance at the risk of health and career. McPherson discusses how such athletes as Lance Armstrong, Marion Jones, and Alex Rodriguez have seen their images tarnished and careers ruined in doping scandals. A complex, shadowy world of athletes who dope, the people and organizations that help them, and the scientists and officials committed to stopping them is revealed. Her writing is brisk, moving through the history anecdote by anecdote in an efficient review.